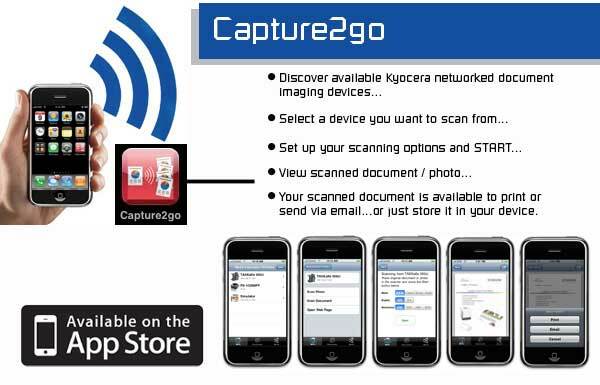 Capture2go is a free document capture application that utilizes Kyocera’s HyPAS (Hybrid Platform for Advanced Solutions) technology, and is available via the Apple AppStore on iTunes for the iPhone and iPod Touch. Kyocera’s Capture2go program allows end-users to seamlessly scan documents on the Kyocera TASKalfa 500ci series of multifunctional products (MFPs) for review and distribution on the iPhone. In addition, once scanned into the iPhone, Capture2go allows the user to print the document on any authorized Kyocera networked printer for increased flexibility and mobility within the enterprise. iPhone and iPod Touch are registered trademarks of Apple, Inc., registered in the US and other countries.